Where: The Southwest corner of Independence and First Streets SW, across from the Botanical Gardens. Look for a blue scarf and flags! We don’t have a sense of how large the march will be, but it is always fun to walk together, meet new people, and enjoy the spirit of the day. Transportation: The closest Metro stations are L’Enfant Plaza (Green, Yellow, Orange, Blue & Silver lines) or Federal Center SW (Orange, Blue & Silver Lines). Another option is Capitol South (Orange, Blue & Silver Lines). Driving downtown on that day is strongly discouraged. See the Metro’s website, https://www.wmata.com/ to make your plans. RSVP: If you want to march with WATER, please RSVP to Hannah Dorfman at waterstaff@hers.com so we can keep an eye out for you. If you have any issues on Saturday morning, please call Hannah at (614) 403-1340. What to Bring: Wear warm, comfortable clothes with good walking shoes—this is not a fashion parade. Plan on some standing around before it starts, and presumably there will be a rally at the end so that is more standing. A water bottle is a good idea. Be sure to have a Metro card with enough fare to get home, as lines to buy them in the stations can be long. Cell service can be iffy in large crowds so a back up communication plan with your friends is a good thought. Texting can sometimes be easier than getting a call through. 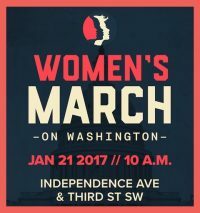 Information: Since we don’t have any privileged information, it is best to consult the March website https://www.womensmarch.com/ for any new details.